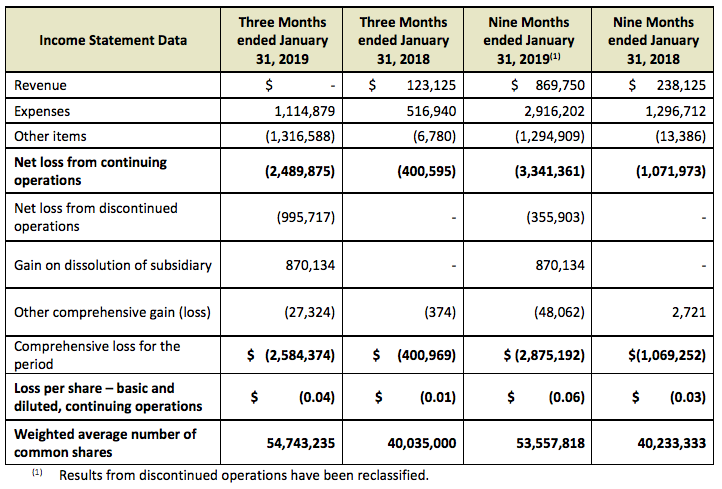 SAN JOSE, Calif., March 21, 2019 /CNW/ -- Nubeva Technologies Ltd. ("Nubeva" or the "Company") (TSX-V: NBVA, OTC: NBVAF), today published its unaudited consolidated financial statements for the three and nine months ended January 31, 2019 and 2018. Financial statements along with management discussion and analysis of financial results can be found at www.sedar.com. All dollar amounts in this release are quoted in U.S. Dollars. The Company reported no revenue from software and services for the quarter due to a shift in business focus following the launch of Nubeva Prisms in the previous quarter. The Company reported that it has 121 active users at the end of the quarter, up from 57 subscribers at the end of the previous quarter, and 173 active users as of the date of this press release. Expenses for the three months ended January 31, 2019 grew by 116% over the prior comparable quarter due to overall growth in operations. An increase in sales and marketing expense accounted for 53% of the increase, an increase in research and development 20%, and general and administrative expense 21%. As previously disclosed, the Company discontinued operations of CBR Project Pte Ltd. (“CBR”), its Singapore subsidiary, during the quarter ended January 31, 2019. The Company had established CBR in April 2018 to provide cybersecurity technology outside North America. In accordance with its token presale contracts related to CBR, the Company distributed digital currency received as consideration for token presales and wrote off the remaining consideration it received in tokens of other issuers. The dissolution of CBR and write off of digital currencies had no effect on the Company’s cash position. The Company plans to continue to focus on delivering its products to a North American market and expand internationally in due course. Assets as at January 31, 2019 decreased by $1,863,911 over assets at April 30, 2018 due mainly to a decrease in cash of $1,793,258. The decrease in cash was due to $2,709,847 in operating activities, offset by $964,799 raised by financing activities. When companies migrate to the public clouds, they lose real-time access into their networks. The impact is that the critical tools they depend upon to monitor security, networks and applications cannot function, and therefore, businesses face increased exposure to cyberattacks and limited diagnostics to their infrastructures. Nubeva Prisms, released in September, 2018, is a breakthrough solution that restores network access and control inside public clouds, allowing customers to utilize their strategic tools and close their security and visibility gaps.